Watch here for information on events in Kansas of interest to outdoor enthusiasts..
Click on the links above for your area of interest or scroll down the page. Photo by Pete Janzen Most of these events are part of the North American Butterfly Association (NABA) Butterfly Count program. Do not hesitate to participate because you cannot identify all butterflies. 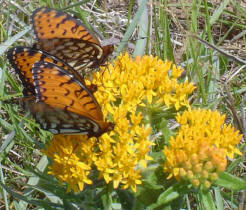 There will be a leader in your group who can identify butterflies and this will be a good learning experience for you. For the NABA counts, please note this policy: All observers, regardless of their age, who contribute to the count, must be listed as observers and pay the count fee. Children who are accompanied by an adult and who do not significantly contribute as observers should not be listed. NABA publishes a report with lists from all of the counts. The report can be ordered at the time of the count if you would like to receive a copy. The price is $7 for NABA members and $11 for nonmembers. Visit the website of NABA for more info on the count program. For explanation and/or further information, please contact Stan Roth (sdroth@ku.edu). Also contact S.R. if you have other calendar events of interest to KS biology teachers, naturalists & biologists. The Kansas Geological Survey formerly led interesting non-technical field trips to explore Kansas. Although they have discontinued this service, you can download their trip guidebooks at the GeoKansas web site and recreate these journeys of discovery on your own! This page also has links to highlights from some of the past field trips. - Know of an event that is not listed?